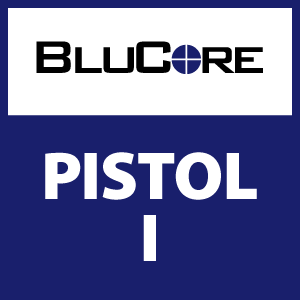 The BluCore Pistol I class teaches weapons awareness, ready positions and shooting fundamentals specific to a semi-automatic pistol. This fundamental level class lays the groundwork for further pistol training, and is a prerequisite for our Pistol II and Pistol III classes and is approximately 3 hours in length, including both classroom and range time. The skills learned in the classroom will be reinforced on the range during live fire drills. All skills learned in this class are foundational and are reviewed and expanded upon in further classes. While one of our core training classes, this course does NOT meet the training requirement to obtain a Colorado Concealed Carry permit and does not cover the assembly, disassembly or cleaning of a firearm. Requirements: No previous firearms experience necessary. Students will need a semi-automatic pistol along with 100 rounds of ammunition. Students are encouraged to bring their own pistols, but rental pistols are available on a limited basis. Students may bring their own ammunition, or purchase from us.